Literally defined, the word Pelekunu means “smelly for lack of sunshine.” (Pukui) Being that it is such a tall and narrow valley, the sun is out for only about seven hours a day. Short days, coupled with the windward tendency for rain, creates a generally damp condition in Pelekunu. Marion Kelly gives an alternate possibility suggesting the name Pelekunu relates to Pele, the goddess of the volcano. The area is said to be sensitive to very light earthquakes that are felt by the folks in the area, thus the name, Pelekunu, “coughing” or “grumbling” Pele. Archaeological evidence suggests this area of Molokai was traditionally the home of the majority of early Hawaiians. The water supply was ample; ʻauwai (irrigation ditches,) loʻi kalo (wetland taro ponds) and habitation sites were found here. Pelekunu is an unusual ahupua‘a for several reasons. Within the Pelekunu ahupua‘a are three lele (disconnected portions of associated land) that belong to ahupua‘a on the other side of the island in the Kona District. Another unusual feature is that the ahupua‘a of Kawela actually extends up and over the mountains at the back of Pelekunu and runs into the valley. In 1898, Johnny Wilson (later Mayor of Honolulu) looked into living in Pelekunu and farming there. Wilson’s parents’ friends included John and Lydia Dominus (Queen Liliʻuokalani) and King Kalākaua. Johnny Wilson brought his wife Jennie Kini Kapahu to Pelekunu to live in 1902. The entry in Johnny’s diary for Tuesday, April 8, 1902, reads, “Arrived Pelekunu & occupied Koehana’s house” According to Bob Krauss, Kini was “one of Hawai‘i’s premier hula dancers” and not used to country life; the Hawaiians in the valley wondered how long Kini would stick it out. Kini did stick it out for quite a while. She helped teach the children in Pelekunu and ran their taro operation while Johnny was away. Eventually, however, Kini did leave the valley; in the summer of 1914, Kini finally got tired of the rain. She staged a one-woman mutiny and moved to a drier place on Molokai at Kamalō, where Johnny had a cattle ranch. The Pelekunu Preserve is managed in partnership with the State Department of Land & Natural Resources through the Natural Area Partnership Program; due to its remote, rugged location, Pelekunu Preserve is not open to the public. Pelekunu Preserve is bordered by four other managed natural resource areas: state-owned Pu‘u Ali‘i and Oloku‘i Natural Reserve Areas (NARs), Kalaupapa National Historic Park and the Conservancy’s Kamakou Preserve. 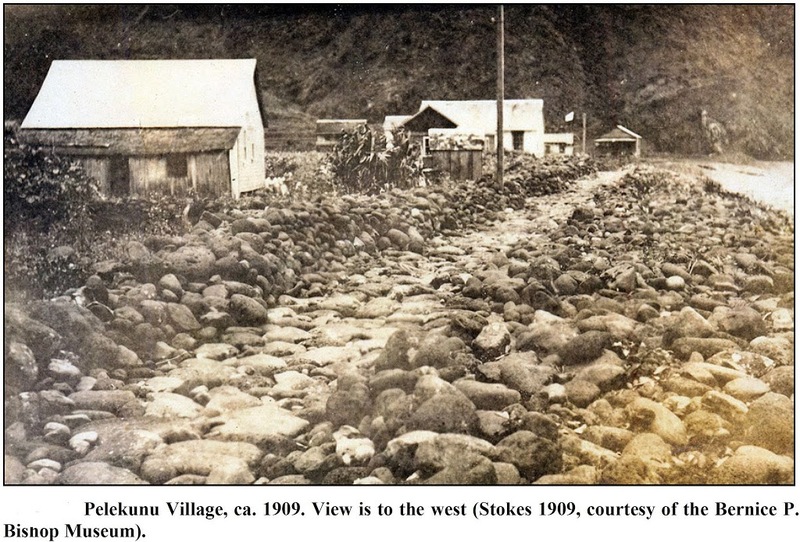 The image shows an image of Pelekunu Village (Stokes, Bishop Museum – 1909.) In addition, I have added other images in a folder of like name in the Photos section on my Facebook and Google+ pages.